WHO is releasing a new guide for employers and meeting organizers to promote healthier working environments. “Planning healthy and sustainable meetings”, initially developed for WHO’s own employees, applies established health promotion principles to meetings and events. Meetings often involve spending a lot of time in a seated position with minimal physical activity, limited access to fresh air and consumption of foods high in sugars and fats, such as cookies and other snacks during coffee breaks. In addition, disposable items such as handouts and plastic cutlery can lead to unnecessary environmental impact. 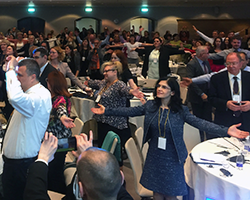 “It sometimes comes as a bit of a surprise for participants to be asked to exercise in the middle of a quite formal technical meeting, but we have had a lot of positive feedback on those breaks – it really helps to freshen up, feel better and even refocus the discussion,” says Ms Tina Kiaer, Communications Officer at WHO/Europe. offer participants appropriate opportunities to be physically active by incorporating physical activity into the meeting agenda or by allowing enough time during lunch breaks for people to be physically active and to refocus their minds. Through these and other positive changes, WHO encourages everyone to make work environments better for all. This guide was prepared as an initiative of the WHO European Office for the Prevention and Control of Noncommunicable Diseases in Moscow, Russian Federation, and funded by a voluntary contribution from the Government of the Russian Federation.